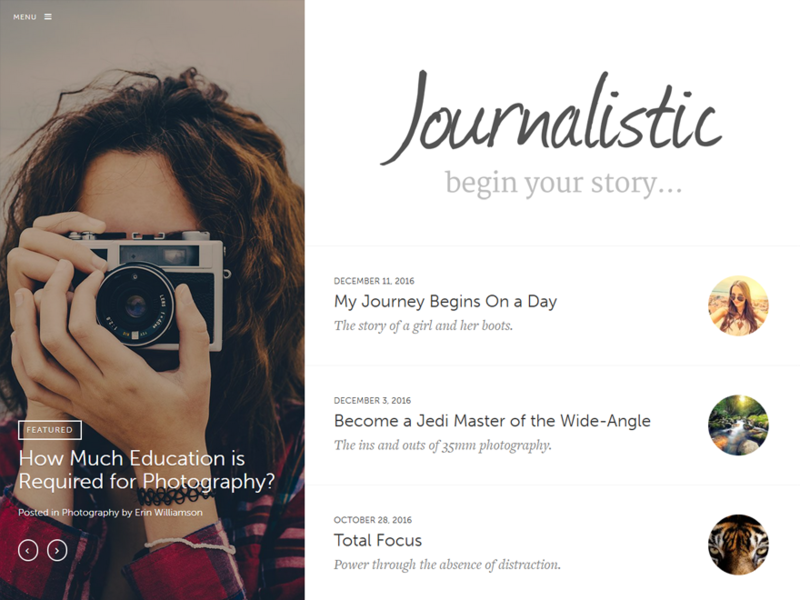 Personalize colors and styles to make the Journalistic theme represent you! Style it to reflect the look of your organization, business website or personal blog. Choose from 19 unique color schemes or set your own custom colors. Optimized for a flawless display on any device from a desktop computer to a mobile phone. Support for Retina images on Hi-DPI screens, we've designed every last detail to ensure your site will always looks beautiful in any environment. RESPONSIVE - Instantly adapts to any screen size. OPTIMIZED - Fast loading, mobile first design. RETINA READY - Crisp, clear images on Hi-DPI devices. 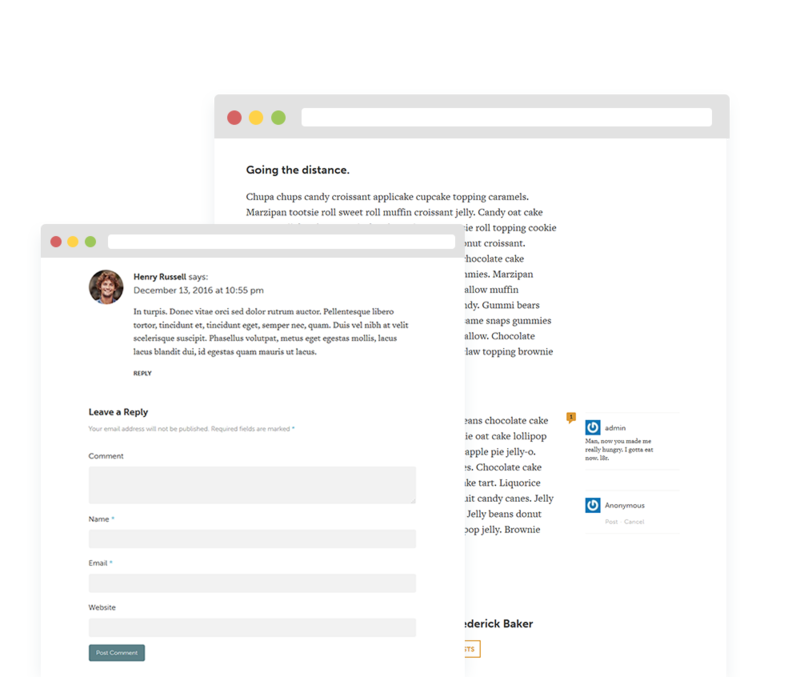 A storytelling tool designed for long-form writing. 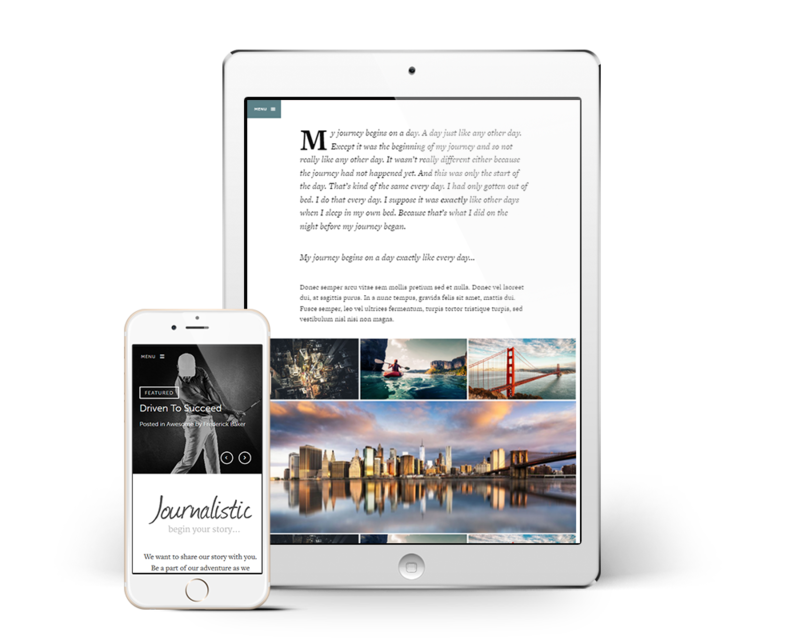 Craft beautiful, immersive experiences for your readers using Journalistic’s deep integration with Aesop Story Engine, a ground-breaking plugin included with the theme. Easy to read, beautiful text using fonts from Adobe® Typekit. It’s all baked right into your site. 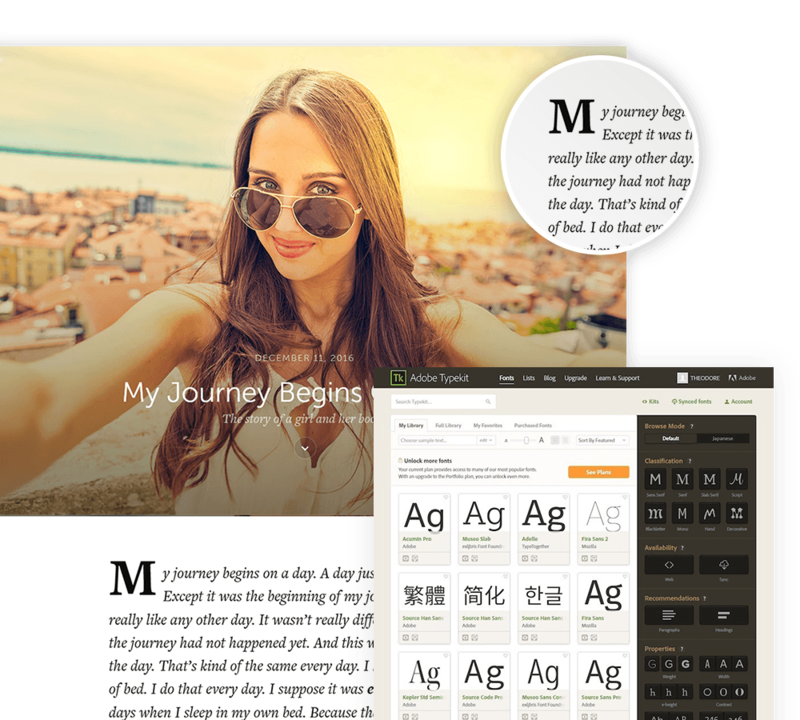 Instantly activate your theme enabling the custom fonts. Add your own fonts with a free Typekit.com account! *Included Typekit fonts are valid for the length of your license. Keep conversations flowing with contextual, inline commenting. Let readers respond to specific paragraphs for a more meaningful discussion. We’ve also includes traditional commenting options at the end of articles, you decide. A never ending stream of articles for your visitors to explore thanks to the built-in infinity scroll for your article and categories. Integrated with the popular Beaver Builder plugin. This included drag & drop tool gives you unlimited potential to create any type of content or layout imaginable. Instantly setup your site content, theme settings, widgets and default WordPress configurations with a single click. Save time and get started fast! Beyond our detailed online documentation and extensive library of video tutorials, we provide quick, professional support to make sure your website is a success. Quick and easy updates, directly in your WordPress dashboard. It's as simple as a single click to automatically update to the latest version instantly. A mobile-ready, responsive design that ensures your site looks beautiful on any mobile device. Select from our pre-defined color schemes or assign your own custom colors for a unique style. Include your social media links directly into the theme to drive traffic to your social channels. Supports right-to-left text languages. Localizes all text for easy translation or multi-language sites. Beautiful and easy to read fonts from Adobe® Typekit. Included free with your theme license. Customize the logo, title, menus, colors and widgets in the slide-out navigation. The fullscreen header images (optional) jump starts your articles with visual impact. Like to tinker? We've made it easy with detailed comments in our lightweight and easy-to-read code. 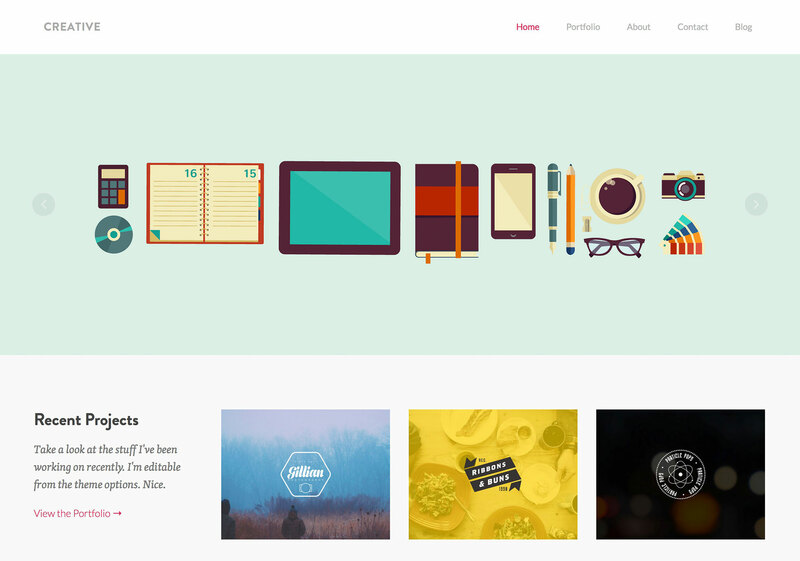 Buy this theme for usage on one website with one year of support & updates. Support license for one domain. Typekit fonts for one year (for select themes). One year of super quick email support. Access to 20+ WordPress training videos. Sign up for UpThemes Hosting and get this theme and 40+ other themes installed on your WordPress website free. 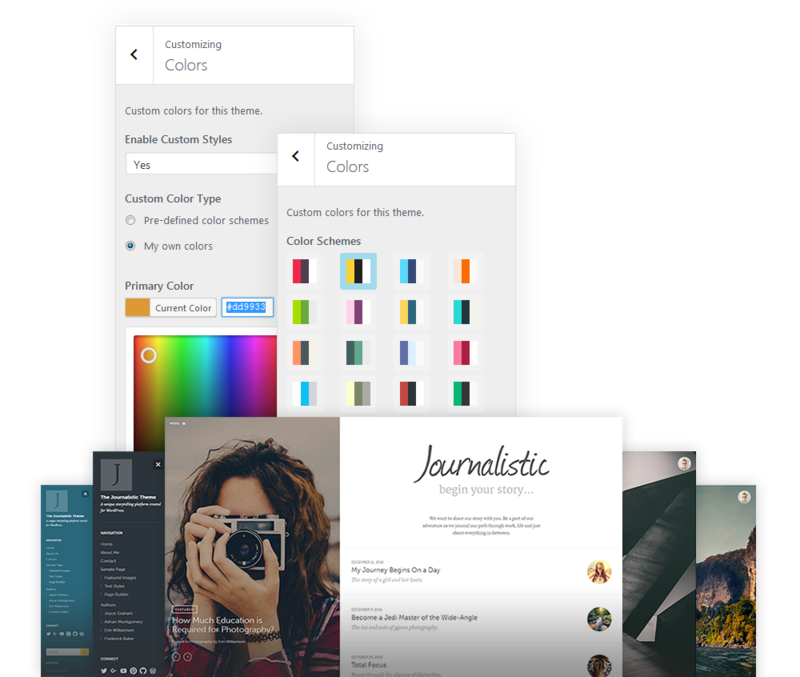 Use any of the 40 hand-picked, pre-installed themes for as long as you host your site with us. Worry-free managed WordPress hosting optimized for speed, security and stability. Everything is pre-installed for you, no additional setup or configuration required to get started. Our themes are all optimized for speed and security and guaranteed to work with UpThemes Hosting. We have other themes we know you will love. Go ahead and try one.